A limited amount of effort is made to determine the influence of system variables, like load, speed, product, or instability on the individual component failures analysis. These variations in process variables are often the root-cause of the observed mechanical problem. Unless analysts consider these variables, they will not be able to determine the true root-cause. Instead, they will make recommendations to correct the symptom (e.g., damaged bearing, misalignment), rather than the real problem. Predikto takes into consideration historical maintenance (PM and Reactive) in addition to operating loads (speed, specs, material, etc.) when developing predictive models to understand when future failures / delays will take place. Too many of the predictive maintenance programs that have been implemented have failed to generate measurable beneﬁts. These failures have not been caused by technology limitation, but rather by the failure to make the necessary changes in the workplace that would permit maximum utilization of these predictive tools. The following steps can help gain maximum benefits from a predictive maintenance program. Changing corporate attitude toward the perception of maintenance and predictive maintenance is difficult, but it is required to achieve maximum benefits from a predictive maintenance program. Studies of equipment reliability problems conducted over the past 30 years, maintenance is responsible for about 17% of production interruptions and quality problems. 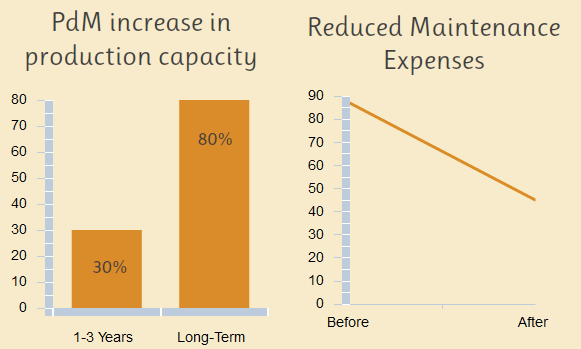 The remaining 83% are totally outside of the traditional maintenance function’s responsibility. Inappropriate operating practices, poor design, non-spec parts, and a myriad of other non-maintenance reasons are the primary contributors to production and product-quality problems, not maintenance. Predictive Analytics – Can you really do this? Predictive Analytics helps increase revenue, reduce maintenance costs, and improve safety through reduction of equipment failure. It is a proven technology for detecting and diagnosing emerging reliability problems far earlier than traditional methods. This innovative technology allows you to migrate your maintenance strategy to a predictive and proactive strategy while not having to change current processes or systems. We continue to run into some hesitation from potential clients hearing our pitch for the first time because they feel this technology or at least the promises for our ability to predict failures in advance is not really possible. We love these challenges. If you capture historical downtimes and meter information in some shape or form, then that is all Predikto needs to show you our magic. Is Industry Domain Expertise Required for Predictive Analytics? Having industry or specific domain expertise is always better when dealing with B2B customers. You are able to understand their problems and speak their language. There might be circumstances where not having domain expertise might help bring out of the box thinking or solutions, but for the most part, it is safe to say that having domain expertise is better than not having it. So, is domain expertise or industry specific knowledge required to provide predictive analytics solutions? I would venture out that it is not required, but always nice to have. In traditional consulting, you need to be an expert in their industry and processes, but for predictive analytics domain expertise is not as important. Clients ask us if we have prior experience in their industry or specific machinery. In some cases we do, but many times we do not. We find that the level of expertise or knowledge we need to gain is specific to the machine or asset we are analyzing in order to predict failures. Having general industry knowledge would not be much help other than being able to speak the same lingo and understand acronyms in their operations. We tackle a predictive analytics problem by letting the data do most of the talking. We certainly want and need to understand the physical behavior of the asset, but this usually takes a few phone calls to understand at a high level their function and clarify anomalies in the data. The science and tools we use to predict failures in industrial assets place a large emphasis on the data and not so much the human operational side of the business. If you disagree, feel free to let us know why. Gartner released late last year the Top 10 Strategic Technology Trends for 2013. Actionable Analytics: Analytics is increasingly delivered to users at the point of action and in context. With the improvement of performance and costs, IT leaders can afford to perform analytics and simulation for every action taken in the business. The mobile client linked to cloud-based analytic engines and big data repositories potentially enables use of optimization and simulation everywhere and every time. This new step provides simulation, prediction, optimization and other analytics, to empower even more decision flexibility at the time and place of every business process action. We are excited to see such a push away from plain Business Intelligence and Data Warehousing and more towards actionable solutions leveraging predictions and process optimizations to add significant value to our customers. 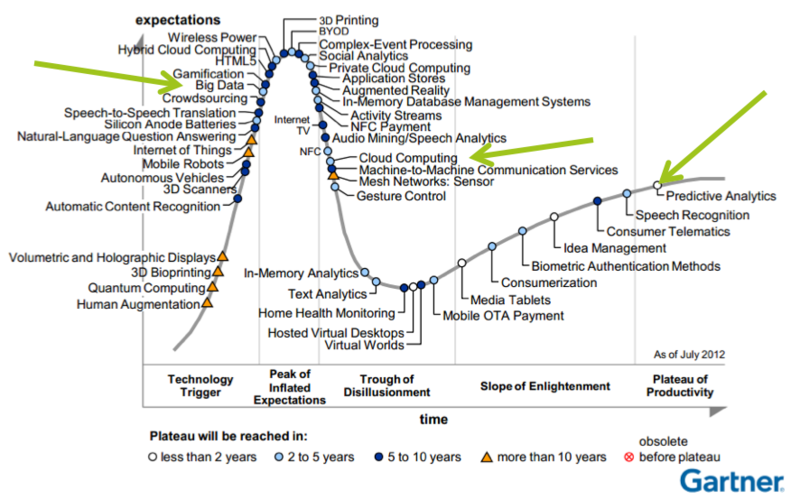 The graph below is from the Emerging Technologies Hype Cycle 2012 published by Gartner. Big Data, Machine to Machine Communications, and Predictive Analytics are positioned well to enable organizations to adopt these technologies. These technologies make up the Predikto sweet spot. Coupling these trends with Actionable Analytics are key to enabling organizations to make impacts to their bottom line. I was surprised to see Big Data so far to the left on this curve, but Gartner is usually very good about capturing enough data and KPIs to support their research. Does you company have a Big Data and Analytics strategy plan? The payoff from deploying a big data and advanced analytics solution can deliver productivity and profit gains as high as 5 to 6 percent higher than competitors. In order to achieve this, companies need to develop a plan and strategy. A successful plan requires dialogue at the top of a company to establish investment priorities; to balance speed, cost, and acceptance; and to create the conditions for frontline engagement. 1) Data: How to assemble and integrate data is essential since data is spread and silted across the organization and somethings in different systems (or organizations). Making the information useful and available is a required capability. 2) Analytic Models: Integrating data does not do much if you can use it to make decisions. Advanced analytic models enable data driven optimization or predictions. The plan needs to understand where analytical models will make the biggest impact to the organization. 3) Tools: The output from these complex analytical models can be complex. So, this output is only useful if employees and managers at the right level within the organization can perform actionable tasks on the information. 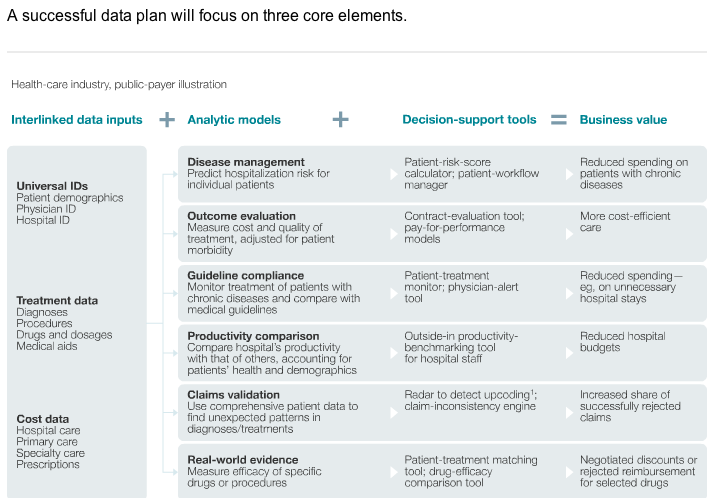 The big data and analytics plans and value will vary by company and industry. The data will come from many sources like customer, vendor, sales, maintenance, and physical objects (like meters). Author prediktoPosted on May 24, 2013 Categories Predictive AnalyticsTags Big Data, McKinsey QuaterlyLeave a comment on Does you company have a Big Data and Analytics strategy plan?